Disney’s Winnie the Pooh is such a timeless childhood favorite of mine. I remember waking in the morning and seeing my sister off to school and sitting down with a bowl of cereal watching Winnie the Pooh on the Disney channel. Ahhhh, memories!!! The Winnie the Pooh movie is coming out to DVD and Blu-Ray October 25th! This great family movie features all the classic, loveable characters Winnie the Pooh, Tigger, Rabbit, Piglet, Owl, Eeyore, Kanga, and Roo embark on a quest to save Christopher Robin from an imaginary culprit while Pooh deals with a hunger for honey. 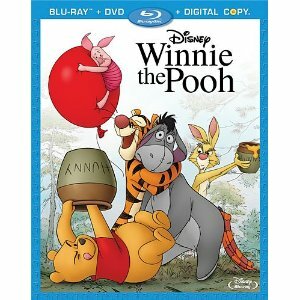 Buy your copy of the Winnie the Pooh movie today or you can enter to win your copy right here! Check out this adorable and fun widget! You can Take The Pooh Personality Quiz, there are two different quizzes one for you and one for your child! Now you can see which character best fits your personality and so can your children with a quiz just for them! Plus fun Winnie the Pooh Activities and Downloads! Download coloring sheets, exclusive “Pooh” cooking recipes, party ideas, crafts, games and more! Disney’s Winnie the Pooh movie is coming to DVD and Blu-Ray is available for $24.99 with free shipping buy a copy of Disney’s Winnie the Pooh today on Amazon! I’m Tigger. Thanks for the chance to win! I was T-I- double G-E-R TIGGER Tah Tah for now!